On 22nd September 2012, Project KHEL (Kids Holistic Education and Life Skills) organized the UN Global Peace Games in La Martiniere Girls College at Lucknow, Uttar Pradesh, India. 75 children from 7 organizations working with disadvantaged children and 5 mainstream schools participated in the event. We received 63 entries for a drawing/painting competition on the themes of ‘What does Peace mean to Me?’ and ‘How Sport can Promote Peace, Tolerance and Understanding’ . Entries were exhibited and judged at the event and the 3 best entries received awards. All the children were organized into mixed groups of 12-13 children each so that they could learn more about each other, especially since they were from distinctly different backgrounds i.e. some were street children, orphans, children from rural areas while others belonged to relatively affluent families. For the event, non-competitive games were arranged for the children. There were six stations where the children enjoyed basketball shooting, kicking a football through a ring, volleyball underhand rallying, cricket bowling at stumps, and a circle of friendship and cooperation game. Many of the children had not played these sports before and basic skills were taught to them by the KHEL coordinators. Children who performed well at any of the sports received small prizes and the best 3 overall performers in all games also received trophies. 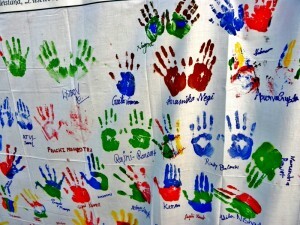 All the children signed and put colorful hand impressions on the Manifesto for Peace drafted by UNESCO Peace Laureates. Adults present at the event were also encouraged to play as part of the mixed teams and they whole-heartedly participated in the games and interacted with the children. It was a unique event as participants were all strangers to each other. The message of support by the Special Adviser to the UN Secretary General on Sport for Development and Peace was read in Hindi and English by two of the children at the beginning of the event while the vote of thanks at the end was followed by the handshake of friendship. In all, the manifesto was signed by 98 children and 23 adults.